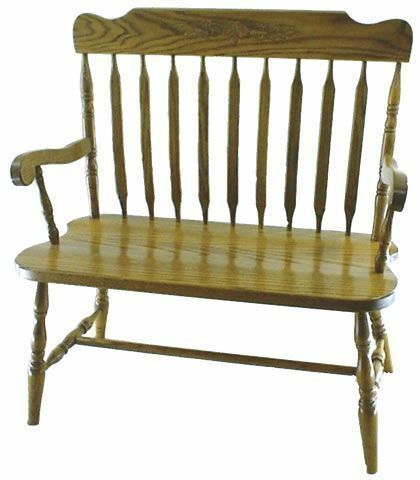 A lovely bench for home or business, the Amish Furniture Bent Feather Bench is handcrafted in solid wood. Adding a warm welcome to the foyer or a coveted spot to sit and rest in a quiet bedroom corner, this wood bench has bent feather spindles and turned legs. Graceful arms curve beautifully. The Amish Bent Feather Bench is available in your choice of oak or cherry wood. This bench comes in three sizes with a 36", 48" or 60" width available. DutchCrafters offers a wide variety of solid wood benches for home or business. We're excited to offer many custom options to create the furniture you want. Please email or call an Amish Furniture Specialist with any questions.